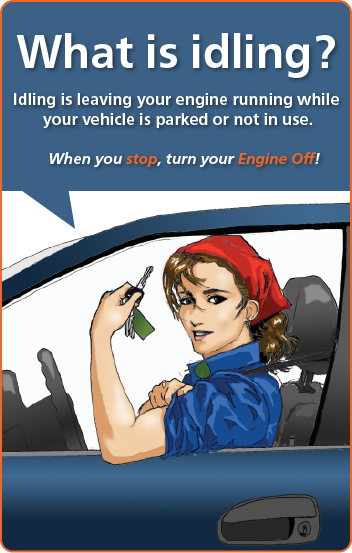 Engines Off is a collaborative effort between the Federal, State, and local governments in Colorado to improve regional air quality by reducing vehicle idling, a significant source of air pollution. While some vehicle idling is unavoidable, such as in traffic congestion or at a stoplight, most drivers end up voluntarily idling their vehicles at various times—in drive-thru lines, waiting to pick-up passengers, while stopped to talk on the phone, and at train crossings, for example. For typical drivers, voluntarily idling adds up to an average of 5-10 minutes a day. Consequently, most drivers end up wasting one to two tanks of fuel per year due to idling. In 2011, the Colorado trucking industry joined with local governments and clean air advocates in Colorado to create a set of recommendations for a statewide idling standard. HB11-1275, which became effective on July 1, 2011, allows communities to limit idling to five minutes within a sixty-minute period for large, commercial diesel vehicles (14,000 lbs or more), with certain exemptions. This consistent guideline enables commercial drivers to comply with the law and protect Colorado's air quality across the state, rather than having to follow a diverse patchwork of local regulations. Some local jurisdictions have also adopted anti-idling ordinances that limit idling of all motor vehicles operating in their community. For example, the City & County of Denver has an ordinance that prohibits all vehicles (cars, trucks, buses, motorcycles, etc.) from idling for more than five minutes in a one-hour period, with certain exemptions. Additionally, Colorado Revised Statute 42-4-1206, more commonly known as the "puffer" law, allows law enforcement officers across the state to immediately ticket individuals who have left a vehicle running unattended for any period of time. In 2008, Engines Off! Denver, the City's idle reduction program, worked on two major activities to reduce vehicle idling in Denver. First, Denver hosted the Democratic National Convention. In anticipation of the dramatic increase in visitors to the city and under then-Mayor John Hickenlooper's direction to make it the "greenest convention ever," stakeholders from across the transportation, tourism, and hospitality industries collaborated on plans to minimize the impact of so many visitors to the city. Engines Off! Denver participated in these green transportation efforts, including hosting workshops for professional drivers. Second, Engines Off! Denver partnered with the American Lung Association in Colorado and local school districts to develop a pilot idle reduction campaign at schools, which became Clean Air at Schools: Engines Off (CASEO). Both of these activities were made possible by Federal Congestion Mitigation and Air Quality (CMAQ) grant funds administered through the Colorado Department of Transportation (CDOT). Engines Off! Denver continued to demonstrate sound program development and implementation practices, so CDOT contracted with them to develop an online tool kit with information and strategies for the general public, communities and local government agencies to start their own idle reduction programs at the local level. This menu application with targeted information and sample materials for the various driving sectors provides cost-effective, statewide distribution of idling information, resources, and proven program models. The result is EnginesOff.com, which was re-launched in April 2012 as a statewide resource for idle reduction efforts. We invite you to explore the website, use and adapt our materials for your community or business, and join us in being champions for cleaner air!